At 0200hrs UK time and indeed, for most of the day today on and off, myself and the very talented author Nico Laeser, the digital designer who created this cover image alongside the simply awesome Christine Southworth, batted backwards and forwards ideas relating to the font and text layout. The first image was far too generic for me, in my head was something smoother, older looking, something to give real ‘feeling’ to the efforts of both artists. I wasn’t keen on the first cover with the italics and the regimented lines, it needed something to make it speak to me. After a couple of hours (the wee small ones in the UK) and much discussion with Nico, he sent through the image you see on the above picture and, with a little 3D magic applied from me, what we have now is the finalised cover to You’re Not Alone – An Indie Author Anthology to remember a very special lady and in aid of a very special charity. We are not far from ebook release now, has to be said, and it’s been a roller-coaster ride of emotions, opinionated debates, occasional fraying of tempers followed by guilt, sadness and triumphant successes. There have been literally thousands of working hours gone into this project so far and there’s still a fair few more to come before we can send it on its way in both formats, ebook and paperback. But with each and every little triumph that we have, like the cover above, I cannot but help feel a growing sense of pride and admiration for the team that have helped me so much to put this together. The day is coming when I’ll be able to announce it, I’m itching to see the reviews already, patience though Ian, patience. Excitement among those of us who have created this is growing, it’s tangible, you can feel it beginning to buzz. Every day people come and join us in the steps to completion on our book site http://www.facebook.com/yourenotalone2015 where each step has been recorded in the process. Come an help me and the team raise a substantial amount for Macmillan Cancer Support, you don’t need to buy it, I’d love it if you did though, but you could simply reblog this, post a link on your facebook, give us a shout out to your family and friends, make some noise in the fight against cancer and help us to help those who really need it. I guarantee you value for money in this book, something for every taste in reader and a whole lot more besides. Go on… follow our page and see if I’m wrong when we release it. I’m proud and humbled to have played a small part in this venture, so it gives me pleasure to add this post to my own blog in the hope that it will generate some interest in our efforts. If I was wearing a hat, I’d take it off in deference to the back-room team whose valiant efforts brought everything together. Kudos guys. Great post Ian and a sincere ‘well done’ to you and the support team. Many years ago I created an idea to raise funds for a charity, and when such a thing succeeds, it is an incredibly humbling experience. I know where you are personally right now. I have great hopes for this piece of work and much of our rapid progress so far is down to your single-minded determination. Quite an amazing amount of international effort went into this work. I feel kind of guilty that I only contributed a few thousand words. 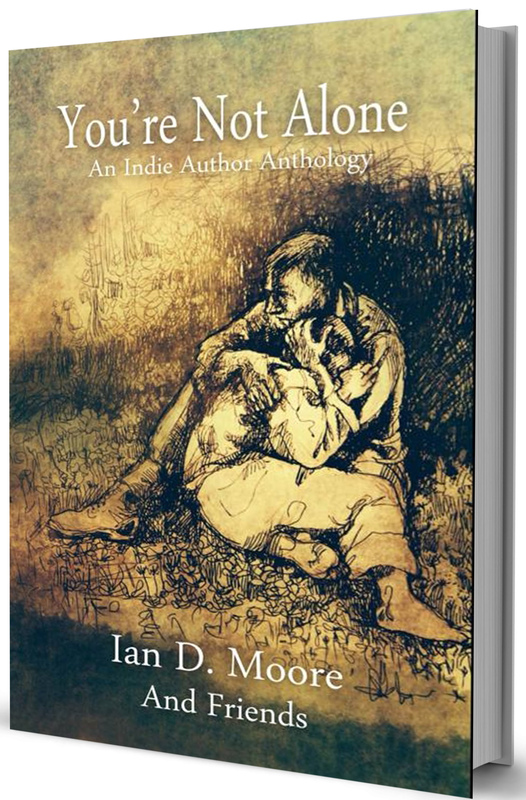 Show your support by helping raise awareness of this venture by Ian D. Moore to raise money for Macmillan Cancer Support by writing You’re Not Alone – An Indie Author Anthology. If you do not care to purchase the book of short stories in aid of Macmillan Cancer Support, you can still show your support by reblogging Ian D. Moore’s blog, share the blog on Twitter and Facebook. And be sure to follow the progress on FB at: http://www.facebook.com/yourenotalone2015 where each step has been recorded in the process. Will you do your part to help with this venture?